After making alarm addition of the touch sensor circuit of motor security, many readers ask me to add the locking mechanisms to this alarm. Thus, if the alarm has been activated, the alarm will keep activated even though the motor’s key is turned off. The addition of a locking mechanism like this actually is very easy. Just by adding a PNP transistor, an NPN transistor, and two resistors. When the transistor Q3 active, Q4 transistor is not active, so the transistor Q8 get base current through the R12 and R7. Thus, the Q7 will also get a base current through the collector of Q8 and R5. Emitter of Q7 directly connected to the + Battery, so even though a key of motor is OFF, this circuit can still get an electric current. It should be noted that in order for the lock circuit persists is that C2 is large enough so that the charge is sufficient to supply the circuit during the OFF period of the Q7 and Q8. Remember that the Q7 and Q8 is active only during Q3 active. 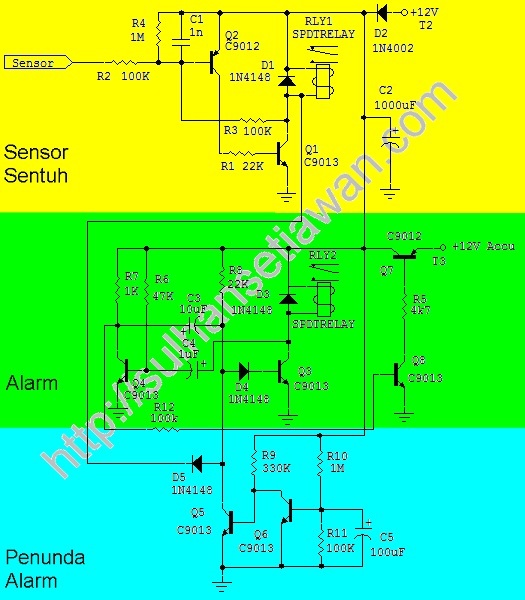 I haven’t try this design yet, so if this circuit can not lock to keep it ON as long as the sensor is not touched, try to increase the value of C2 with a larger capacity, such as to replace a 2200uF.